Are you bored with ketchup, mustard and relish hot dogs this summer? Variety IS the spice of life! 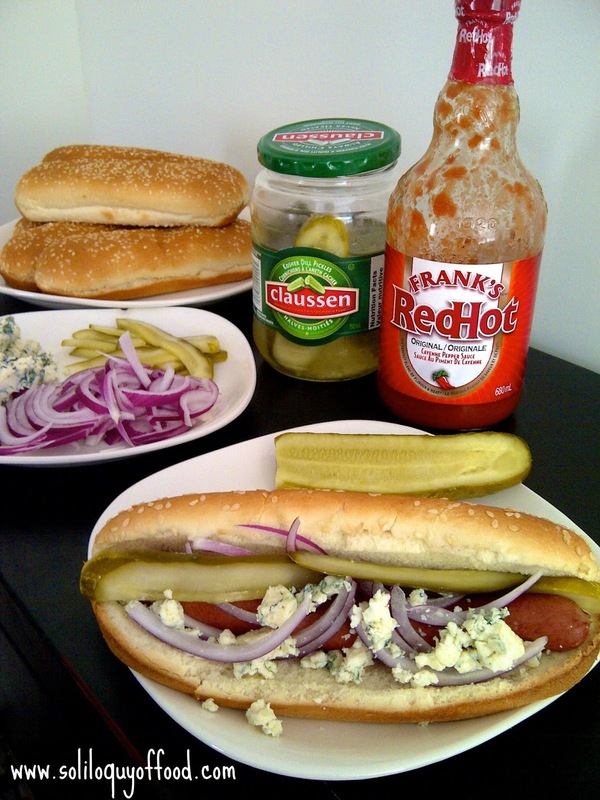 These Buffalo Blue Hot Dogs are inspired from a local hot dog joint back home in RI, Spike's Junk Yard Dogs. Spikes has 8 locations throughout southern New England...so if your are in the area look them up! So, once your dogs are cooked according to your favorite method you can get to work on the assembly line (normally I would grill our hot dogs, our grill is broken down for traveling purposes...I boiled them this time). Fist, start out with the dogs and bun selection. I used a soft, sesame topped hoagie bun for these babies. I'm going to be loading them up, a normal hot dog-sized bun just won't work here. We were so excited to find Nathan's brand dogs up this way - they were definitely put to good use here. Next, slice up some red onions and fresh deli-style dill pickles. At this point, I highly recommend taste-testing a pickle, just to ensure its integrity. Now is where I might loose some of you......blue cheese. You either like it, or you don't. I have shared, HERE, how we came to enjoy it - splattering a 5lb tub of it on yourself might have the same effect on you, no? Now that you you have all the toppings lined up, they can be individually made according to your preferences. S requests heavier on the hot sauce, heavier on the blue cheese, and extra pickles....yeah, he's high maintenance! Begin hot dog assembly now! Grab a few napkins, these dogs are messy!! Cook the hot dogs according to the manufacturer's recommendations. Nestle the dogs into the buns. Dividing the onion, pickles and blue cheese crumbles amongst the hot dogs - tuck the sliced red onions and sliced pickles down between the sides of the dog and the bun, and crumble the blue cheese along the tops. 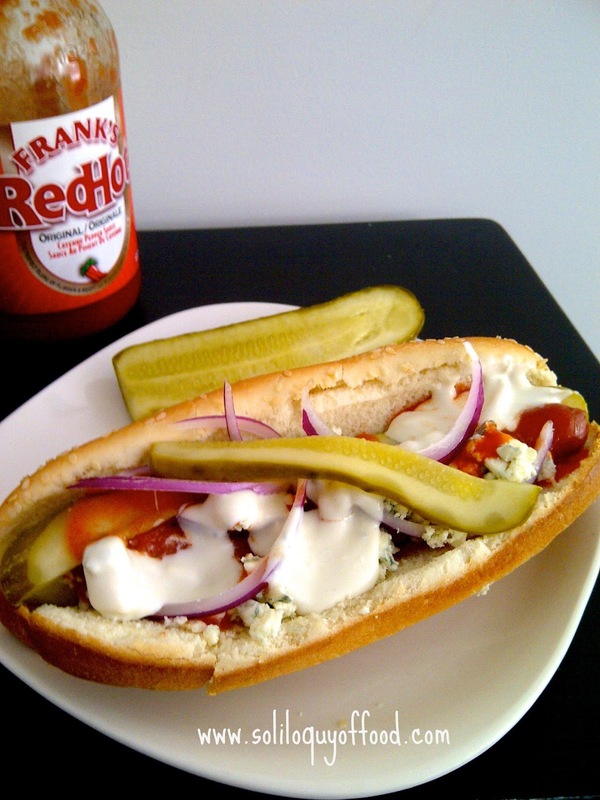 Add an appropriate amount of hot sauce (we use Frank's Red Hot) and blue cheese salad dressing. Add a few more onions and pickles, if desired. 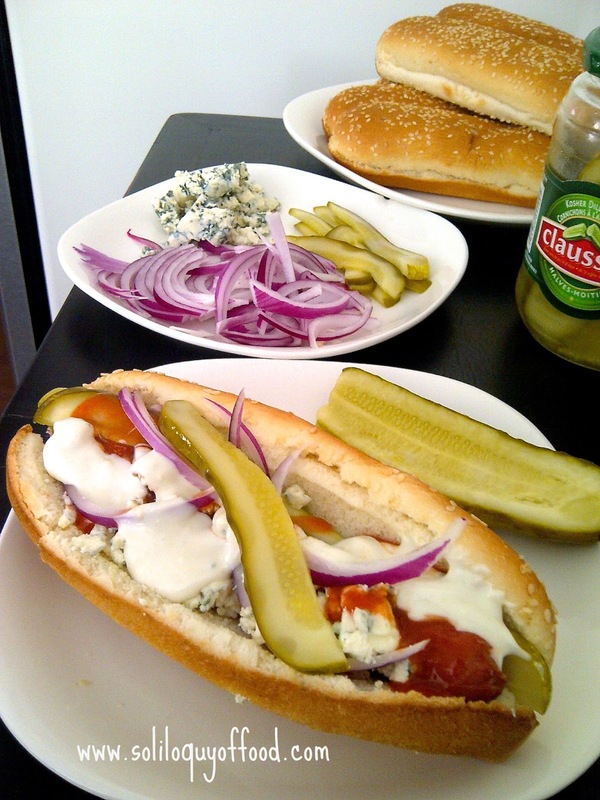 Hot dogs are my go-to guilty pleasure! Michigan is very specific about their hot dog toppings (no ketchup? crazy people!). I love how you smother yours in blue cheese dressing. Can't go wrong. Stopping by from Tasty Tuesdays! 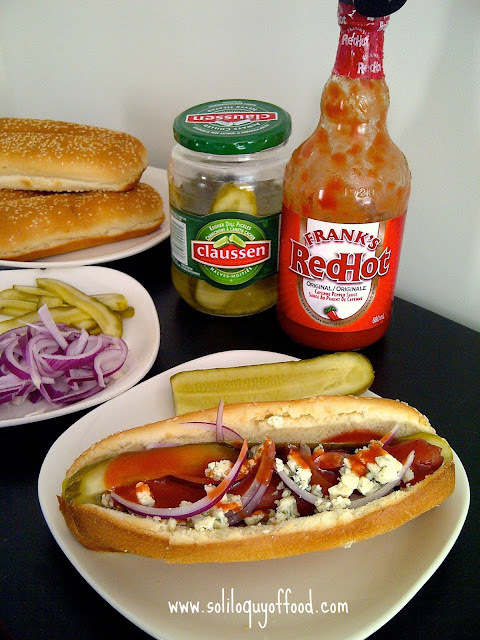 I love hot sauce on my sandwiches but never thought to put it on a hot dog. Yum! Hi, this hot dog looks interesting with all these things added! I saw it on katherines corner. Ooh I love Buffalo sauce and blue cheese but have never had it on a hot dog! Looks yum! Pinning it. Thanks for sharing at All Things Pretty! My family would be loving these hot dogs! Thanks for linking up with What's Cookin' Wednesday! Yes!!! These look uh-mazing. 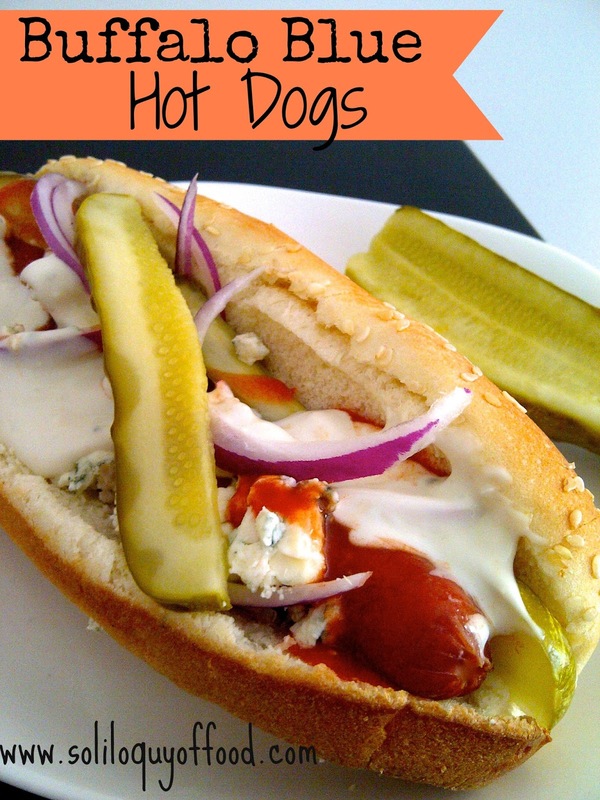 :) My kids love hot dogs, so I am always looking for fun, new ways to jazz them up. Can't wait to try them this way! Love this! We are featuring it as one of our featured recipes on Wonderful Food Wednesday - come and see at 7pm EST. I really love this, Kim! It looks ah-maz-balls!